Whether it’s Oscar from New Zealand Airlines or Mildred of Lufthansa, chatbots are a key peg of the digital experience strategy of travel enterprises. And they are driving higher revenues too - Rose, The Cosmopolitan’s virtual concierge, has increased customer spending on the hotel property by 39%. On the other side of this transaction, a TravelZoo survey pointed out that 80% of over 6000 travellers surveyed across Asia, Europe, North and South America, think that bots will be an accepted and helpful component of their lives by 2020. Offering superior digital customer experiences are the way forward for travel enterprises. And between your customers expecting simplified interactions, and competitors already launching bots with quirky personalities; the decision of whether or not to invest in a chatbot is out of your hands. The only question that remains is what kind of a chatbot you should design, and how soon can you launch it. The chatbot experience can go two ways: either the user gets exactly what they want from the bot and are very satisfied, or they keep asking questions that the bot cannot answer, and get frustrated. More often than not, the bot fails to perform well because the user is asking questions, or trying to perform tasks that the bot wasn’t designed for. So it’s extremely important that you clarify in your chatbot design what the bot can and cannot do. This goes for both the team that’s developing the bot, and for the users of the bot. For the development team, it’s important to realize that a chatbot is not a total replacement of your website or customer service executives. It cannot do everything for everyone. So it’s better to have a bot that’s limited in what it can do, but does its one job really well. To begin with, you need to choose a set of key tasks that your bot should be able to do. This can usually be extracted from understanding some of the most common tasks that people perform on your app or website - searching for tickets, enquiring about offers, queries about documents required, etc. Once you know these, you know what your bot should be able to solve for, and design it to do those tasks well. Have a welcome message that clearly states what the bot is capable of. For example: An airline bot’s opening message could be something along the lines of, “Hello Boris, where do want to book a flight to?”. Or a booking website chatbot could state. “I can book a room for you at some of the best hotels across the world. Which city are your travelling to?”. 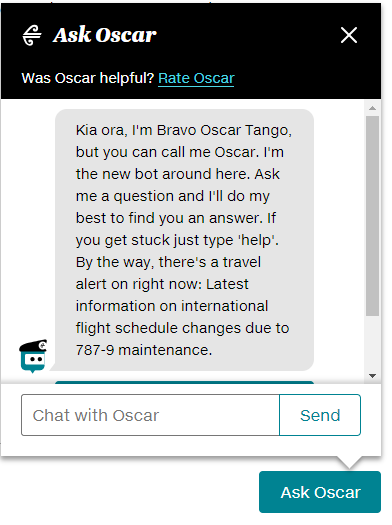 Oscar’s welcome message here tells the users exactly what to expect from the chatbot, and what to ask next. Have pre-programmed answers as option buttons. Option button are a great way to guide a conversation and keep it on track, giving users a clear understanding of which answers are acceptable and how to respond next. They also set the right expectation of what are the types of tasks your bot can handle, and what would be out of bounds. Have clear apology messages. When the bot is unable to adequately respond to a query, the error message should explain exactly what the issue it. Or it should offer up a new suggestion that users might find helpful in a given context. A generic reply like “Sorry, I can’t help you there” causes frustration with the bot. But a message like, “I don’t think I can help you with that. But would you like to try exploring one of these options instead?”, is great, because the bot still attempts to help the user. One of the major reasons that chatbots are an improvement over human interactions is their ability to access past interactions and context, to personalize the conversation, while upselling new services. As an airline company, if you have data that a particular traveller flies business-class, your chatbot can use that information to be proactive in anticipating the traveller’s needs. A quick question by the bot, “Flying business class as always?”, can make the conversation more personal, and the traveller more inclined to fly business class. Similarly, an airline reservation bot can expand services to prompt cab bookings as soon as you land, or suggest great bars and restaurants at the airport if you have a layover. For chatbots designed to be tour guides, the ability to leverage past behaviour and weave that into the conversation becomes crucial. Creating a complete map of user preferences, based on past interactions and transactions, can go a long way in personalizing travel experiences for individual users. For example: Foursquare’s Marsbot does a great job of offering travel and entertainment recommendations based on user’s previous Foursquare check-ins. However, it’s also worth noting that making personalized recommendations alone cannot make a great chatbot. You have to back it up with actual problem-solving capabilities, like the chatbot being able to book the recommended places, make advance payments etc. to truly be valuable for users. While chatbots are meant to automate a lot of the customer conversations happening at travel enterprises, it’s not advisable to leave them out in the wild, on their own. There are customer queries that could be too complicated for the bot, and inability to answer them could lead to a bad user experience. Usually bots can give out a customer care number on which to call and end the conversation. But your travel bot could go a step further and ensure that customers do not have to change channels to get answer to their questions. There should always be a human who can take over automated conversations and help answer queries that lie outside the bot’s capabilities. What’s important to ensure is that the switch from bot to human should be a smooth one, and clearly communicated to the user. For example, you could have a message like “I am sorry I cannot answer that. Would you like to speak to our customer happiness ambassador?”. Simple yes/no answer option gives users the choice to carry on their conversation with a human, and makes it very clear that a switch has taken place. Activation Rate: The number of people actively choosing to use your chatbot to complete their tasks is definitely an important metric to track. This shows whether your users are willing to try a different route, and how many of them believe that a bot will actually be able to help them get the job done. However, you will need to define the activation as more nuanced than just how many people click on the chat window. The focus should be on measuring how many people see a message from the bot and actually respond to the questions asked by the bot. In other words, measure actual interactions over clicks or likes. Session Duration: How long a user interacts with the bot is another critical performance metric. The depth of the interaction indicates whether the bot has been able to initiate a meaningful conversation and lead the user through a helpful buyer or customer’s journey. However, what you can consider a good session duration would depend upon the purpose of your bot. If your bot is a simple reservation agent, then the entire conversation can be wrapped up successfully in four or five questions and answers, and that’s a good interaction. On the other hand, if your bot is more of a tour guide, then longer interactions are desirable, where the bot is recommending and exploring different travel experiences with the user. Goal Completion: We started off with deciding what a bot can and cannot do. So each bot you build has one, or more, goals to achieve: ticket booking, driving more customers to a hotel’s in-house entertainment properties, answering specific questions people have about travelling in a particular city, etc. The number of times the chatbot is able to lead users to completing those goals is probably the most important metric. This shows whether the bot is able to do what it was designed for. In both these cases you will need to make some quick changes to your chatbot. 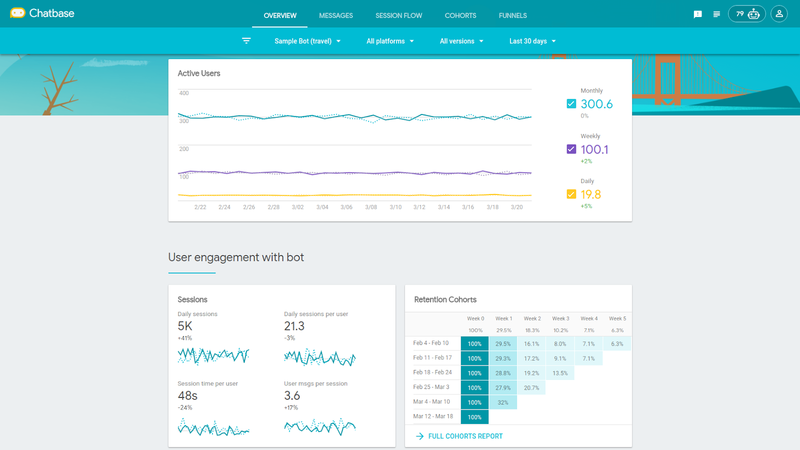 Source: Google's Chatbase is a great analytics tool for understanding chatbot performance. Confusion Rates: How many times is your bot unable to satisfactorily reply to a user query? How many times is it confused or gives the wrong answer because it didn’t understand the question entirely? Measuring the confusion rate is crucial to understanding where your bot is failing, and if there might have been common interaction scenarios that you did not account for. Of course, bots learn better with increased usage, so the confusion rates will definitely be high to begin with and then slowly taper off. But you should definitely keep an eye out for consistently high confusion rates. The travel industry is at the cusp of a tremendous growth wave. And the ability to leverage emerging technologies to deliver great customer experiences is going to be the key to getting your share of the growth pie. Chatbots are one of the most prominent of these emerging technologies, and you need to get started with them sooner rather than later. Srijan’s chatbot development teams can help you design and develop a chatbot strategy tailored to your business requirements. Tell us a bit about your business goals, and our chatbot experts will be in touch.